There’s a new group of birds on the block at Moody Gardens and we’re thrilled to introduce them. Meet the Humboldts! These unique warm-climate penguins hail from the coastal areas of Peru and Chile, but this group will now call the Aquarium Pyramid their new home and are settling in nicely in their new exhibit near the South Atlantic Penguin Habitat, home to the King, Gentoo, Chinstrap, Rockhopper and Macaroni penguins. Contrary to belief, not all penguins love the cold. The majority of penguin species actually live in warm climates. 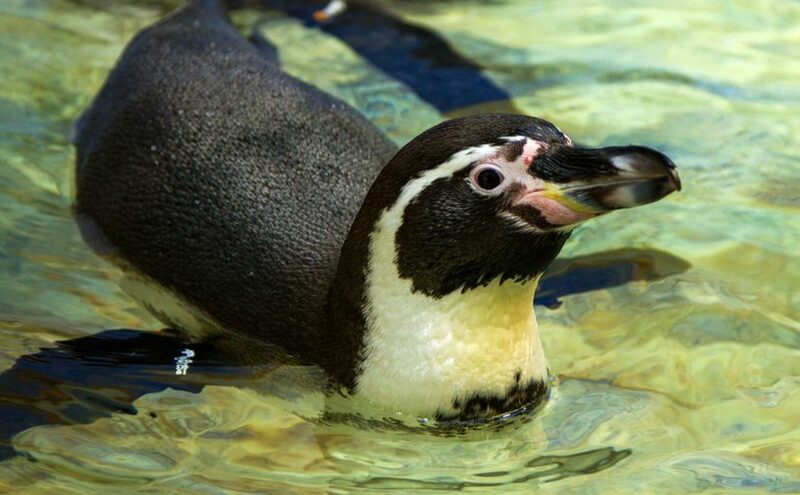 The Humboldt’s natural habitat is more like a desert, and you’ll easily notice the difference between it and our South Atlantic Penguin Habitat.You’ll be able to see this threatened species above water and underwater, where they can swim up to 30 miles per hour! The Humboldts are easily recognizable by the black band of feathers across their chest and the pink patches on their face, feet and the underside of their wings. You may think you’re seeing pink feathers, but it’s actually bare skin. Humboldts have to avoid overheating, so when they get too hot, they can shed extra body heat by sending blood to the bare parts of their bodies, thus making them pink. We’re not only adding new penguins to the aquarium – we’re giving you a chance to see them up close when we bring the Humboldts outside of their exhibit for keeper chats and to interact with guests! The addition of the Humboldt Penguin Exhibit is just part of the multi-phase $37 million renovation at the Aquarium Pyramid. You’ll get to meet the Humboldts, and their new friends, starting May 27 when Moody Gardens hosts a grand reveal at the aquarium.